After years of largely ignoring widespread use of its trademarks on everything from in-world groups to business web sites, Linden Lab recently announced the launch of the Second Life? Brand Center, which features a new set of explicit, fairly restrictive guidelines regarding the use of the company’s trademarks. Some residents are upset, and with at least some cause. There are a lot of very large groups and institutions with names that are implicated in this change in policy, most of which chose those names at least partly because Linden Lab did not appear to be interested in policing these marks until now. Organizations that potentially are subject to the new guidelines (if they have not secured written permission to use the marks) include the Second Life Herald, Reuters Second Life, Scripters of Second Life, the University of Second Life, Business Women of Second Life, the Arts Council of Second Life, Real Life Education in Second Life, Bisexuals in Second Life, and even the informal professional association I started in 2006, the Second Life Bar Association. A quick count of group names and web sites reveals thousands, if not tens of thousands, of instances of potential infringement. Residents in good standing are allowed to use “SL” and “inSL” in business and organization names and domains as long as they are used with at least two generic nouns, or your own mark. So “SL Bar Association” is okay, but “SL Lawyers” is not. Using your own mark lets you get down to one word, so “Dell SL” is okay, but “Computer SL” is not. Acronyms of otherwise acceptable names can be used as domains. Residents are not allowed to register any trademark that includes SL in this context — which adds a whole new layer of complexity to the SLArt trademark registration issue that Thayer Preece, one of VB’s guest writers, covered in detail in January. Residents are not allowed to use the eye-in-hand logo or the term “Second Life” without written permission. I’m guessing that isn’t going to be easy to get, since Linden Lab appears to be taking steps to protect these specific trademarks now. Organizations with “Second Life” in their name may want to consider a name change or explore the written permission option, if they have not already. Finally, they say that they’d like you to put a ? symbol after “Second Life” and a ? symbol after their unregistered trademarks (including Linden, LindeX, and SLurl) when you use the terms “in text,” and you’re also supposed to follow “Second Life” with a generic noun. For example, you are now asked to refer to “the Second Life? world…” instead of “Second Life.” This is widely misunderstood. The request is not enforceable against news organizations or most non-product-oriented blogs. It can only be enforced if there is potential brand confusion (e.g. in advertising for another product). That last bullet regarding the is use of the ? symbol “in text” is confusing to a lot of people and is worth exploring a little further. It does not mean that every news story and blog post about Second Life needs to include these symbols. You only have to follow these requests when your use isn’t considered “nominative.” Basically, when brand confusion is possible — in advertising. The key is that use of the marks in news coverage and analysis is considered “nominative use,” and doesn’t require any license at all — so they don’t get to tell you how to use the words in that context. The AP Stylebook guidelines say that trademarked names should be capitalized in text, which is appropriate because it helps avoid genericide (and angry letters from lawyers) but that’s really all commentators and reporters need to do in text. Note though: like any other brand identifiers, blog banners, names, and graphics are subject to the rules pointed out in the other bullet points above. While it is unfortunate that Linden Lab waited so long to do this, the reality is that they have the right, and probably the obligation, to police these marks. If they do not enforce their rights now, they risk an abandonment argument later. One could actually argue that the four-plus years they’ve encouraged the use of some of these marks constitutes abandonment, though it’s not a strong argument. If one was in the mood to fight, a better argument would be “estoppel” — essentially, that because Linden Lab encouraged the use of the marks (e.g. in text accompanying their fansite toolkit) and people took action based on that, that Linden Lab can’t now change its mind without at least paying for the financial damage caused by the change. Lawsuits are expensive though, and the fight is probably not one that many Second Life-based organizations are going to be willing to take on. My conclusion? Although there might well be a legal argument available if somebody wanted to try to make it, most users are going to be better off simply taking steps to move into compliance with Linden Lab’s new policy. To its credit, Linden Lab has given organizations 90 days to analyze the policy and take any necessary steps before it begins enforcement. March 28, 2008 – Edited to add information regarding potential estoppel claim. Thanks so much for spelling this out for us in terms I can understand. ALT + 0174 makes ? ALT + 0153 makes ? I should trademark ALT + 0174 and ALT + 0153. Incidentally, Taran’s original post (linked here) is worth a visit for readers interested in this issue. He’s dealing with this as a guy with a site that uses a tagline that is somewhat similar to “Your World. Your Imagination.” (which is also one of the trademarks LL is protecting) and so he brings a publisher’s perspective to this question. Thanks Benjamin. I actually had a bunch of links open in my browser and (you’re going to laugh) was about to write more on this subject… And I was doing the ALT + 0174 combination, forgetting to put the numlock on… and I lost all 18 tabs when my browser opened the 3 normal tabs as home. So I didn’t write it. But I did learn that if you like to use the ALT key combinations you should make sure your NUM-LOCK is on. Thanks for a clear explanation of the muddle LL created. I inherited Bisexuals in Second Life from its founder last year, so I promptly created a new group Bisexuals in SL just in case! The next question is: How do I get 1300+ members to move over to the legally respectful version? The current fad of freaking out over corporate IP and image protection is mostly about how to shoot one-self in the foot. There is no question that brands need to protect their identities, but restricting use also means reduced visibility which is the last thing Linden Lab needs at a time where competing virtual worlds are coming to market. There are many examples of good and bad corporate IP management over the last several decades. The fear of losing one’s brand name to public domain has led more brands to oblivion or obscurity than market supremacy. I recall how agressive Polaroid was in defending their brand when they were king of hill. It made no difference in the end as the popularity of the brand name neither helped nor prevented the firm’s demise from its original market. I would go even further and suggest that in some cases the benefit and exposure gained by promoting the use of one’s image far exceeds the potential loss of ownership and control over that image. Corporations who are smart about managing their brands generally burry the ones who are more concerned about the proper and legal use of their image and IP …. generally because they have smarter management. Until now, many “brand builders” would have considered SLBA to be an entity that is independent of Linden Lab. It has an independent mission from Linden Lab, separate activities, and represents a different “product”. If you, or anyone, decides to invest in such an entity (as many have done over the past years), you would have been able to register it as a business. You could form a legal certification body as a part of it, you can write books and sell them on Amazon, and you could license others to proudly display their membership affiliation. You could even register it as a trademark. 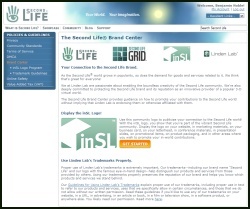 There is a good chance that USPTO would not perceive consumer confusion between SLBA and Second Life, the product from Linden Lab. In other words, before March 24th, 2008, it is your brand, your investment, and your benefit. Of course it is linked to Second Life, much as many aftermarket businesses are linked to Microsoft Word, a product which Microsoft licenses to you and you do not own. However, when you click on the new ToS, you have agreed to a contract which nullifies these rights as well as destroys the value of any investment you have made in building good will or loyalty to such a brand over the past 5 years. You are no longer able to register SLBA as a business. You are not allowed to attempt to trademark it. If somebody attempts to start another SLBA, you have relinquished your right to use the standard legal protections of your state or government to enforce it. Anyone can steal your SLBA label and you have little or no recourse using the real-life legal mechanisms set out by our governments to protect business interests. Moreover, if Linden Lab does not like what you are doing, they can revoke your right to use the SLBA label and all your uses of it at their discretion. 1. Going forward, nobody would possibly ever incorporate the letters SL or inSL in any business or activity that they expect to accrue value or seek investment for. While this is true of “Second LIfe” (and has been), it has little or no impact on new businesses and is a good brand protection strategy for Linden Lab. 2. Those who have already invested heavily for the past few years have to decide whether they will relinquish their right to legal protection for their activities or undertake an (in some cases costly) rebranding and rebuilding of their audience under a new brand. 3. Those who have believed the “Your World, Your Imagination” philosophy have good cause to question whether Linden Lab may not be so dedicated to preserving the IP of those who make Second Life successful as they have stated in the past. It casts doubt on the idea of using Second Life as a business building platform not only because of trademark and patent reasons, but also because of the realization that Linden Lab’s claim of “Your World” is really just an fictional product bullet-point to motivate consumer interest rather than a true commitment as some have perceived it. I should add that I am not a lawyer. I am simply a significant business stakeholder who has spent significant money building a brand (SLCN.TV) that is not only recognized inworld but has been talked about favorably by Linden Lab itself without even a hint of objection. In truth, I am very much in favor of Linden Lab protecting their investment. I have a large stake in their success. However, I do not believe that their behavior over the past 5 years would imply in any way that businesses like SLExchange, SL i-Reports, SLNN, SLBA and many others are not “real businesses” and that Linden Lab, not their creators, own the associated brands. To introduce such a policy change *in this way* at this time seems neither in the business interests of Linden Lab or their customers. I am very interested in other opinions on this. @7 – great comment. I absolutely see where you are coming from. I’m wondering if I ought to register “Virtual World Bar Association” too as a group name, in case they change the rules later. In fact… I think I’ll go do that. What’s another L$100? I was wondering about you guys too — SLCN.tv should be okay as a domain, but I’m sure you’re branded with “Second Life” all over the place. I wish there was a better answer than just, “well, looks like we have to go along with this” but fighting it is probably prohibitively expensive, and wouldn’t have a great chance of success anyway, in spite of the fact that they allowed this situation to develop. They own the trademarks, and they can choose to enforce them. Abandonment would be the best argument, and it just looks too chancy to recommend in my mind. Obviously, you’d want to talk to your lawyer (who knows the details of your situation) for legal advice on this — but my quick analysis is that it’s just not going to be worth it for most people to fight this. Maybe they will grant written permission more freely than I’m guessing — I suspect the SLBA will consider that route as well, though I have no idea what the membership will ultimately decide to do. We have been pretty cautious about using “Second Life”. While many people refer to us as “Second Life Cable Network” and we even have used it ourselves from time to time, we have been careful to use SLCN.TV in all official domains, copyright notices, program watermarks, URLs, etc. I think the bigger issue for me is wondering whether it’s possible for *any* business to encourage derivatives for a period of 4 full years, imply strongly that those making derivatives have IP ownership, state no objections, profit significantly from such derivative efforts, and then claim ownership. I think it’s clear from their linking and P-R behavior that they actually encouraged usages such as SLExchange, SLBoutique, etc. long before their trademark filing for “SL” and that the appearance of *any* product which could be construed or confused with Linden Lab “SL” came only after the larger community adopted the abbreviation. Had the branding program and promotion of “SL” as an official, and proprietary, abbreviation started long ago, or even have been mentioned once or twice before last week, I think it would be easier for me to understand. The “but they let us do it for a long time” argument actually is shorthand for a pretty reasonable legal argument on this point, called “estoppel.” The idea is that if one party encourages induces an expectation and encourages people to act on that expectation, and then people do act on that expectation (and it costs them money) the person who encouraged the action can’t change his or her mind later without paying for the cost. Basically, the argument would be that Linden Lab’s 4+ years of outright encouraging the use of marks at great expense to users in a formal written agreement prevents them from changing their mind now. This is a pretty expensive fight, though, and I am guessing that nobody is going to challenge them on it. A brand owner who wanted to fight could, however, possibly get some of the “information wants to be free” folks to back the suit. If you want some giggles, set Google Alerts to ‘Second Life’. You’ll find that many things get ‘second lives’. It makes me wonder how the trademark office stamped ‘Second Life’ as a valid trademark. I’ve got one of those on (“Second Life” + Law) and I routinely get posts about people getting a second life sentence for their second murder conviction. I’d have to pull their application, but I suspect that they only get the mark in connection with offering a virtual world. I’m just curious: what do you think the chances would be of certifying a class for a class action lawsuit if there end up being a sufficient number of entities with real pecuniary losses due to this change in policy? Most of these look dead-on to me. The biggest hurdle is that it might be difficult to do a damages calculation for the class, since the cost of changing could differ significantly by source, but I could see that being handled with sub-classes and, if I remember correctly, differing damages calculations is not usually fatal. I’m going to see if I can talk a class-action expert I talk to occasionally into dropping by and weighing in — any readers out there who work in this specialty, your comments would be especially welcome here. Ben, posted this in response to your comment over on NWN, but thought I’d cross-post here and do my part to help clutter up the blogosphere. Yes, reporting on Second Life in our blogs is nominative use, and under trademark law (US at least) we’re probably in the clear and don’t have to follow Linden Lab’s wishes that we mark things with an ? or say “my Second Life experience” rather than just “my Second Life.” However, isn’t there a wrinkle that comes out of the Terms of Service? The new ToS, and its section 4.4, mandate that we comply with LL’s guidelines on using their marks. By agreeing and continuing to use SL, haven’t we bargained away our ability to use the marks nominatively? They can already throw you out for any reason or no reason at all, so the analysis of whether you give up your right to nominative fair use by clicking on the TOS is somewhat moot, but legally, you definitely can give up rights in a contract (for example, you give up the right to sue them anywhere you want to in the TOS in favor of venue in San Francisco, a right you’d otherwise have). There’s a point where it would be just the height of stupidity to enforce it though — and pitching every blogger who decides to follow convention and simply capitalize their trademarked terms would definitely hit that point, imho. They’d essentially shut down 99% of the buzz machine. My guess is that they’ll clarify this point in favor of nominative fair use in their upcoming press release, while sticking to their guns on the rest of it… but we’ll see, I suppose. If they decide to take a hard line, they can toss ‘Benjamin Noble’ as a test case if they’d like to. I’ve already said I will use their suggested text in promotion for my book and for VB, but I have no interest in polluting the copy at VB with trademark symbols for one of the many companies I write about, and would be willing to have that fight. In fact, I suspect that the EFF would consider assisting in a case like that, now that I think about it. @17, 18 – Once again, I am reminded of that phrase ‘contract of adhesion’. Yes, the EFF *should* be interested – as would Robin over at IPJustice, if they grok the situation. I have tossed some things their way in the past. Hypothetically speaking, since I am in the same boat that Benjamin is, I’d probably do something similar – or the same. It is really in their interest to permit nominative use. On Your2ndPlace, someone posted using Microsoft’s EULA as an example (blech) – but I responded, “Look at Coca Cola”. Also noted there about where the Y2P conversation is. Good to see Ham on the ball on this community issue. This is a really common misconception I see a lot concerning trademarks–that once you trademark a term, you can prohibit all other use of that term. This is simply not the case. Registered trademarks only apply to the goods and services for which they are registered at the trademark office. Common law trademarks only apply to goods and services they are actually used in connection with. So can Linden stop others from using the SECOND LIFE mark in connection with virtual world stuff? More than likely, if that other use is in a trademark sense (i.e., to identify goods or services of a third party). Can they stop others from using it on, say, bicycles? Maybe not. (I say maybe because the doctrine of trademark dilution in the US allows for protection of famous marks on unrelated goods as well). And whether connected to a virtual world or not, they have no right to police use of the terms “second life” if they are not used in a trademark sense (e.g., someone posting to their blog that they “have a second life inside Azeroth”). @24: I didn’t say that they could prohibit all use of the phrases. I know that. I simply pointed out that it was humorous. I later elaborated in 15 and dragged it into a questionable context. Can another virtual world have a second life? Puns with trademarks. Thank you for playing, thayer. What to you say Rick? When the town chooses to dress like the naked emporer they will most likely all catch a cold as well. Lesson again why those who allow, believe and promote SL “as” the metaverse are short sighted and not too bright. Never has the “company town” been so easy to illustrate in a representation of “main street” that is full of the “corporate” logo on every stores windows…. More and more adults back to believing in the tooth fairey and easter bunny. Well maybe not, i read a post last week that a major SL business/ lender and noted “citizen” was found out to be only 9 years old. on 16 Apr 2008 at 11:56 am28 Nexeus Fatale » Blogger Strike?